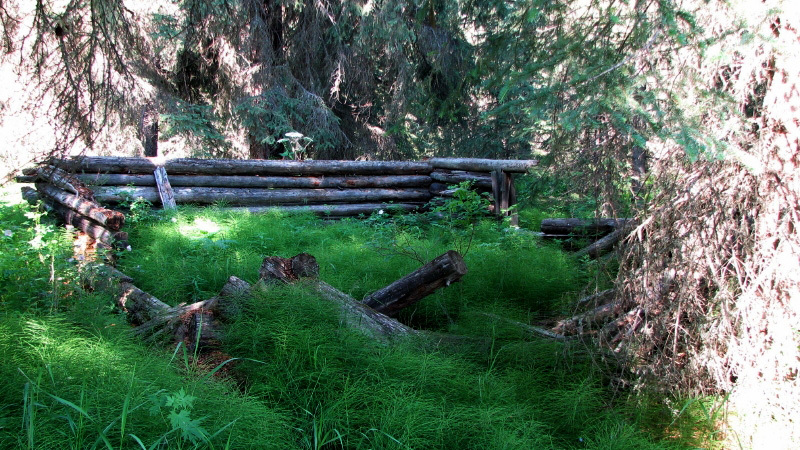 The 450 metre (1/4 mile), easy trail to Long Lake leads to a picnic table on a promontory overlooking the lake. The quiet lake shore attracts wildlife. Look for moose, elk, bear, beaver and other mammals, and for waterfowl. Sunset is a special time to enjoy this area, with optimal lighting and wildlife viewing opportunities. Long Lake’s shape is unusual, 1000 metres long and nowhere more than 100 metres wide. It is hemmed in to the north and south by long ridges composed of glacial debris, and the lake occupies the trough between them. These remnants of the Pleistocene Ice Ages, which were formed between 17,000 and 22,000 years ago, were once melt-water channels that filled with debris as the great ice sheets melted. Once all the ice disappeared the debris remained as long, sinuous ridges known as eskers, or ridged glacio-fluvial sediments”. Contrasting with other lakes in the region, Long Lake has a stony bottom (also representing sediments transported and deposited by glacial meltwater). Other features in the surrounding area that reflect this glacial history include lacustrine beaches, remnants of deltas, and sand dunes. Upstream (west) the lake drains a tamarack and black spruce bog. Downstream (east) it empties into a creek frequented by beavers, which then empties into the two Little Prairie Lakes. These small, round lakes may have been caused by giant blocks of ice that were left behind as the ice sheet retreated. Once these blocks melted, depressions would have remained that are still filled with water. 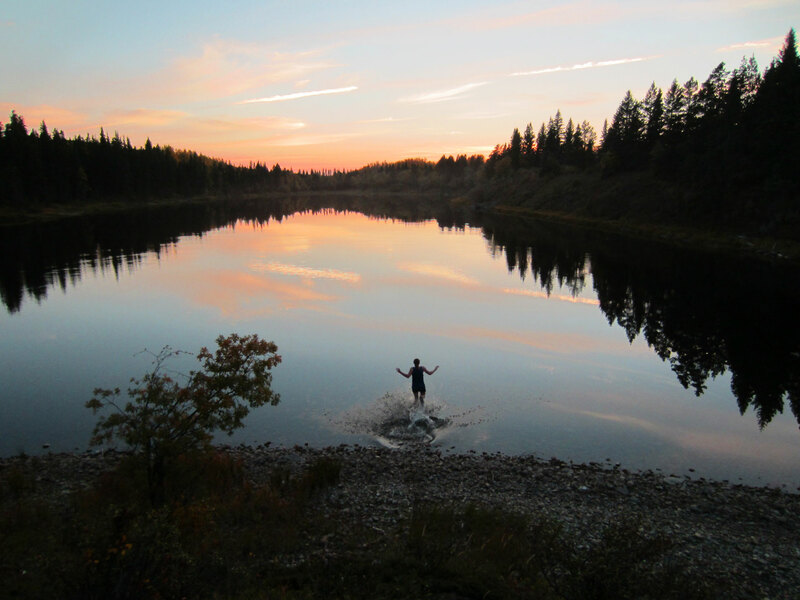 The Redwillow River flows just 400 metres north of here, parallel to Long Lake. Eventually, the creek that drains these lakes empties into the river over two kilometres downstream, once it finally is able to flow past the northern ridge. 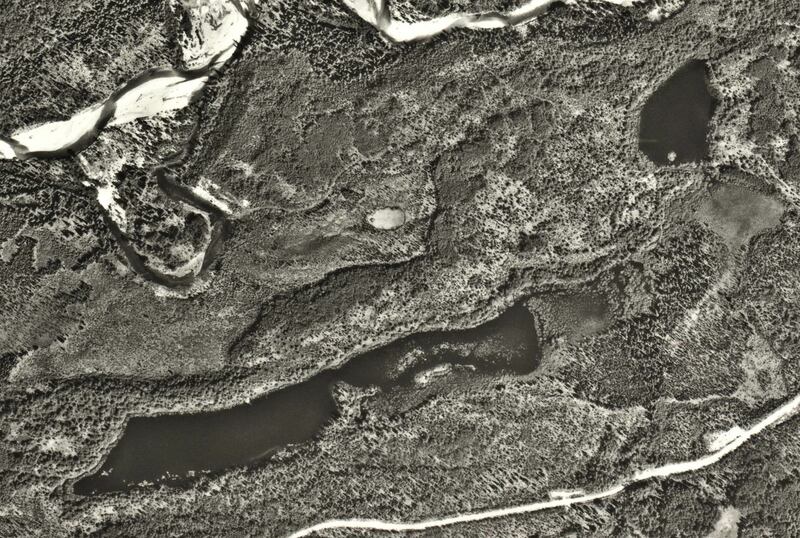 Long Lake, the eskers, the Little Prairie Lakes and the Redwillow River are seen in this aerial photograph from the 1960s (see below). In the late 1930s the Monkman Pass Highway was built just south of here, in a heroic effort to build a route for Peace Region farmers to transport their grain to the Pacific Ocean. The lakes were well known to these pioneers, and formed a site for one of their camps. One of these trail blazers, “Doc” Moore, wrote engagingly about his experiences here. Aerial reconnaissance photographs from the 1960s demonstrate an old track (probably used by carts and wagons) that led from Little Prairie Lakes to a site just 300 metres north of here on an old oxbow of the Redwillow River. It is still possible to trace this old route, which leads through a drift across the oxbow and ends at the remains of a trapper’s cabin, probably dating to the 1930s (pictured below). Surrounding this area are the stumps of many trees logged then for their timber. Even lightly touching these fragile, 80 year old stumps causes them to crumble. Trumpeter Swans are the largest waterfowl in North America, and once nested across much of northern Canada and Alaska. Hunting by European settlers, possibly coupled with the habitat changes that accompanied settlement, drove this species to the brink of extinction. In the early 1900s it was thought that Trumpeter Swans were extinct in Canada, but a small breeding population was then found near Grande Prairie. The Grande Prairie – Trumpeter Swan Important Bird Area was established to protect the species, and is now home to an annual swan festival. The species has enjoyed a remarkable comeback, and has become re-established in large parts of its former breeding range. The population in northwestern Alberta and adjacent British Columbia now numbers hundreds of breeding pairs and is the largest in Canada. Breeding was first documented in British Columbia in 1976, and in 1981 sixteen breeding pairs were noted in the Peace Region. A 2005 survey by Ducks Unlimited and the Canadian Wildlife Service estimated the total British Columbia population at 1,126. A 2010 survey by the U.S. Fish & Wildlife Service estimated the total North American population at 46,225. There are now probably over two dozen breeding pairs on secluded lakes in the eastern portion of the Tumbler Ridge Global Geopark. The eastern end of Long Lake provides one of the easiest places from which to observe them. Patience may be required, as the swans are often hidden in the lakeside vegetation. The swans are part of the Rocky Mountain population, and winter in the Wyoming, Idaho and Montana area of the USA. 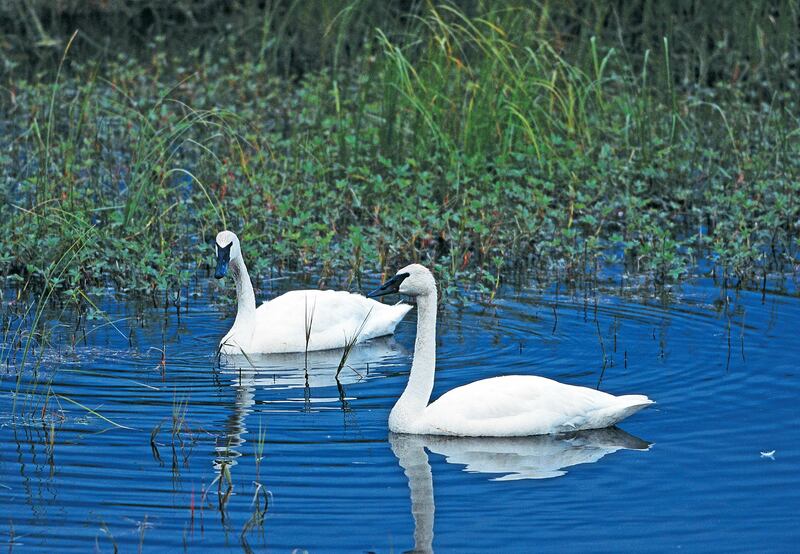 Trumpeter Swans prefer small, shallow lakes with emergent vegetation. Nests are piles of marsh vegetation. Up to six eggs may be laid, although the typical brood size is lower.